Do Space and Time have an Archetypal Design? The physicist Wolfgang Pauli (1900-58), one of the founder of quantum mechanics, was highly fascinated of Jungs archetypes. He conceived them as the underlying principles of the physical world. He even suggested a research program in order to explore the physical meaning of these archetypes. But this research program never became reality. This article gives an example how this research program could look like. 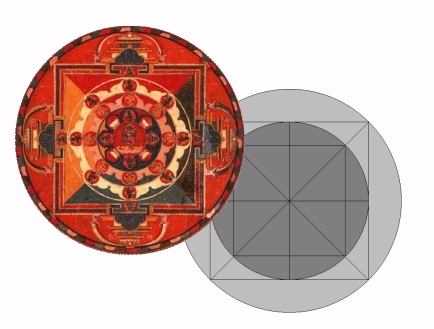 It refers to a structure consisting of different circles and squares that are put together in a specific way; a structure, which is traditionally called a MANDALA. By making Einsteins special theory of relativity geometrically compatible with a transcendent background this archetypal structure surprisingly came up. As its speed limit is given by the speed of infinity, it includes the possibility to overcome special relativity theory (SRT). Natural Philosophy Alliance, USA 2007, 23 pages. The first step in scientific revolution or paradigm shift is the awareness of the existence of an anomaly. That means to see clearly that a specific fact cannot be explained by a universally accepted paradigm. Although relativity - one of the most driving paradigms of contemporary physics - is working efficiently in the most cases but there is one fact, which cannot be explained by it. This fact concerns a specific coincidence. Physicists have observed that the local inertial compass coincides with the frame of the most distant galax-ies and quasars within the present measurement accuracy of 2.5 x 10^-4 arcsec/year. In modern physics Machs Principle is the hypothesis most favoured to explain this fact. It maintains that the local inertial compass, f.e. Foucaults pendulum, is determined by all the masses in the Universe in such a way that the measured coincidence is given. As Machs Principle implies that not only gravity but all physics shall be formulated without any reference to an all-pervasive background like an ether, it is physically considered as the climax of relativity. But Machs Principle could never be formulated in a precise way. The above-mentioned coincidence is still unexplained. But it is not yet epistemologically recognized as an anomaly that breaks the relativistic paradigm. In this paper an argument is presented that could change the epistemological status of this fact tremendously. Actually this fact can be explained as the signature of an omnipresent and invisible entity. A new approach towards a Modern Metaphysics is presented. It shows which physical implications might be connected with the condition of transcendence. An answer: "Dear Mr. Smith, ...until now no one has found a way to conduct metaphysics in such a scientific fashion. As far as the One, that is, the assumption of a transcendent foundation of the Universe, is concerned, the belief in the guise of religion is still the dominant force: It decisively determines how we think about this One. This force is profoundly irrational. In its fundamentalistic form it is even highly dangerous. If we leave the interpretation of the One faith, then we leave it irrational forces. In the past we had to accept this dominant role of faith because no one knew how to conduct metaphysics in a scientific fashion. But this task can as conceived by me be done. The key to it is precisely the property of transcendence, which previously represented an insurmountable barrier of knowledge. This barrier can actually be overcome, because transcendence is with respect to the physical universe such a restrictive condition that the possibilities of how the universe might look like, are so far limited that only one structure is likely." The unification of relativity and quantum mechanics is the main problem of modern physics. It is still unsolved. The root of this problem could perhaps be the relativistic postulate of the invariance of the speed of light. In countless experiments it was found that the speed of light does not depend neither on the velocity of the light source c(1) nor on the velocity of the observer c(2), but in special relativity this dual constancy of light c(1) & c(2) is not clearly understood. In Einstein's theory these two parameters c(1) and c(2) are simply supposed as two fundamental principles of nature. In this paper it is shown how this dual constancy of light c(1) & c(2) could be considered as an expression of the quantum mechanical wave-particle-dualism. This quantum-mechanical interpretation implies not only a dual parametrization of c, but the existence of a sort of ether (probably the vacuum) as well. As the result of the dual parametrization of c an etherdrift is predicted, that is significantly smaller than all the values which were expected in previous times. Even if the velocity of Earth of approx. 390 km/s with respect to the cosmic microwave background is taken, the observable ether drift would only be of D = 0.0003 km/s. Since the Kennedy-Thorndike experiment in 1932 led to a Null result as the historical Michelson-Morley experiment did in 1887 it was almost collectively believed, that special relativity was proven right again. But in truth a completely new face of c was discovered, which Einsteins theory had not been taken into account. Can the Universe Be Completely Digitized?